"In the early 1920s, some gentrifiers began fixing up the old brownstrones on Beekman Place. But the biggest change came in 1924 when Joseph B. Thomas bought the plot at the foot of East 51st Street on the north side, then a collection of wooden industrial buildings. Thomas, born in Boston, had admired Fenway Court, the Venetian-style building in his hometown that is now the Isabella Stewart Gardner Museum. In 1910, he had redeveloped East 19th Streeet between Irving Place and Third Avenue as the 'Block Beautiful,' transforming the declining brownstones with bright stucco and romantic ironwork. On the 51st Street plot Thomas had the architect Treanor & Fatio design a six-story apartment house of Venetian design overlooking the water. The earliest deisgn, published in 1924, showed the building with a light court facing the river and a covered arcade with a few steps down to the river. This was soon revised to a south-facing light court, which gave fewer river rivers but better light, and a more developed treatment at the riverside - an open lawn bounded by an urn-topped balustrade leading to a Venetian-style dock. There was also an upper garden area, leading to 51st Street. The principal river traffic at the time was coal barges and tugboats, but in 1924 the Real Estate Record and Guide praised the anticipated Beekman Terrace, noting that 'the absence of gondolas alone prevents a full conception of the Italian atmosphere,' adding that 'a profusion of trees and other planting will make the river bank at this point a garden spot.' The irregular brick facade is decorated with terra-cotta plaques showing the lion, the symbol of Venice's patron, St. Mark, and maritime symbols recalling Venice's days as a trading empire....The $600,000 co-op, with about forty-five apartments, was completed in 1925, and the earliest shareholders included harold Pulsifer, the poet and editor of Outlook magazine, and Charles Poore, book reviewer for the New York Times. The territory must have seemed remote, for advertisements for the apartments promised private jitney service. Original drawings for the building do not call out any unusual uses for the two floors below the grade of 51st Street, but an illustration published in Arts & Decoration in 1924 shows a large Gothic-style, leaded-glass window at the level of the river, as if leading to some sort of club room. The East River Drive wiped out all the interesting wrinkles of the waterfront in the 1940s, and photographs at the time show the lower garden area as a simple grassy area surrounded by a perimeter of hedges. But the constantly increasing traffic on the drive has left the lower garden about as peaceful as the median on the Grand Central Parkway." 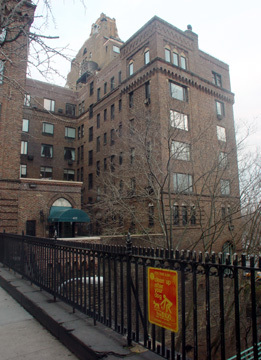 While the building's dark tone is somber, it is flanked to thewest by several handsome and larger brown-brick apartment buildings of very good quality and its battlement-like stringcourses and its descent beneath street level make it appear quite fortress-like and the bedrock of strength for Beekman Place. Its small entrance pavilion lends it some mystery and the building's site gives it some remarkable views down the river.